For a long time, it’s been believed that the money was the key to motiving employees to greater productivity. But research has proven that monetary rewards are way down the motivation list under factors such as recognition, sense of purpose, work-life balance and ability for advancement. Added to that, it is now discovered that the workplace environment has a major impact on motivation and productivity. For this reason, people require a variety of spaces that can facilitate focused, collaborative and social work in both open and enclosed environments. By providing optional workspaces that accommodate various personalities and work styles, you can help to motivate your employees to work more productivity. 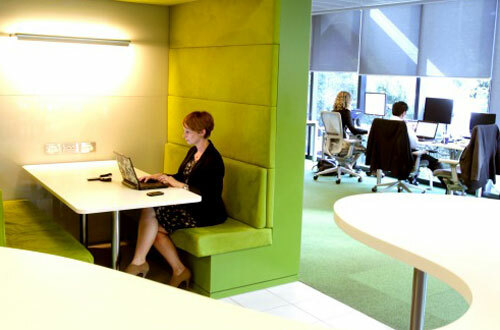 With that in mind, here are 3 layout ideas that can help make your workplace more productive. There is a shift towards more homely-styled workplaces and it’s the high tech companies such as Facebook that are leading the way. Because of the younger workforce that are seeking greater work-life balance, they are kept motivated with interiors that feel more like high-class homes than offices. By creating an environment where the line between private and work time is blurred, employees feel taken care of, are more at ease throughout the day and are motivated to work more productively. Breakout spaces grew out of the youthful explosion of dot.com enterprises of the late 90’s. Made up of bean bags and wacky seating, it was a place to bring a bit home into the workplace. However, it has now been discovered that meetings conducted in less formal environments are extremely productive for brainstorming and creative idea generation. As a result, they are now considered one of the 5 key zones required to achieve maximum productivity in any workplace. With the right design, it can support short or spontaneous meetings which can also reduce the demand on closed meeting rooms that always seem to be booked out. 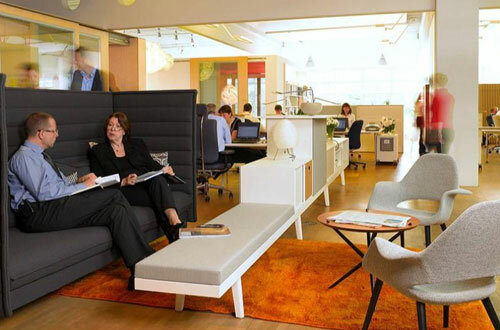 Open-plan layouts are fast becoming the norm in modern workplaces, with the idea that they encourage interaction and productive conversation. However, not everyone works the same way and while some thrive in open space, other need more closed spaces to concentrate. Peaceful pods are spaces that do just that. They provide a temporary space away from the noise and movement of an open office when deeper concentration and focus is required.